a little life changing magic. One secret of a happy life—having just the right stuff, with no clutter. The Stuff Cure shows you how this goal is achievable. It’s a proven method to unstuff your excess, organize what you keep, and regain control of your life. Along the way, you’ll find opportunities for fun, profit, virtue, and helping create a better world. and I have read many - including the national bestsellers." 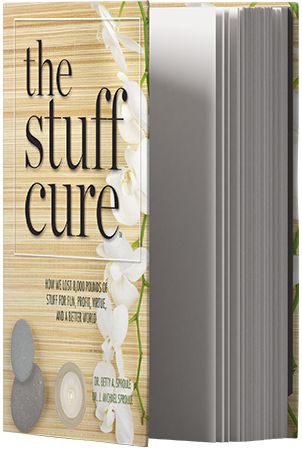 Sign up for The Stuff Cure Mailing List, get GREAT TIPS, and get your FREE copy of "25 Great Gift Ideas with More Joy, Less Stuff to Please Everyone on Your Gift List". Betty and J. Michael Sproule have shared 43 years of marriage—a life filled with opportunities to collect fabulous things from their dual careers, from raising two now-grownup sons, and from travel to 49 U.S. states and 17 countries. Beginning married life with a 600-square-foot apartment, they became Stuff-Cure converts when faced with the need to downsize the contents of a Victorian-era house of 6800 square feet that was home to packed closets, full shelves, and boxes long unopened. Finally they had to face the consequences of having lived in ever-larger homes in Ohio (twice), Texas, Indiana, Missouri, and California (twice). By the way, if you’d like to pronounce our name the way we pronounce it, know that Sproule rhymes with “soul”—not “owl,” “school,” or “unruly”!